An easy walk mostly along the bank of the Great Ouse following the Ouse Valley Way. Where it crosses the B1049, take care as no footpath. The entry into Earith is also dangerous along the verge of A1123. Plenty of birdlife, with cattle and horses. Leave St James. Turn R towards A123. Turn L along main road Turn R down Green End. At bridge join Ouse Valley Way. Turn R Continue along path to marina. Turn L still on Ouse Valley Way. Turn L on Ouse Valley Way. Turn R Cross main road keeping to right hand side of road to bridge. Turn L onto Ouse Valley Way Follow Way to marina. Skirt marina, down road. Turn L onto main road. Very dangerous!! Turn R at brow of hill (FP sign under arrow sign) With Twenty pence cottage on your right, keep to bank by river. Keep to path. (At some times of year, one mile of the path is difficult to walk through). At Hermitage Marina, go over metal bridge, following FP signs Ouse Valley Way. At top of wooden steps, go L over fence down to Hermitage Lock as FP blocked by nettles. Up stairs by lock. Turn R to main road on path following Ouse Valley Way. Cross main road and, using the verge, walk towards Earith. ( Road carries fast moving traffic). In Earith, turn R onto Bridge End. Turn R onto Colne Road L onto FP down Whybrows Lane. Through metal gate Cross field to metal gate Follow path. Turn L through trees. Skirt field. Go straight ahead through metal gate. Past allotments. Join lane (East End) Past playing field on R Turn L Hollidays Road towards church. Turn L down main road. 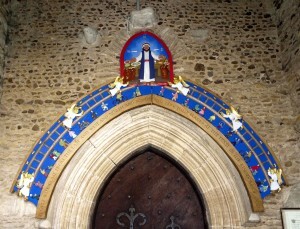 Way station is the artwork in the church porch over the arch.